Delta 2xMQM & 3.6CPM year end Mileage Run & lower Targeted FREE Status! 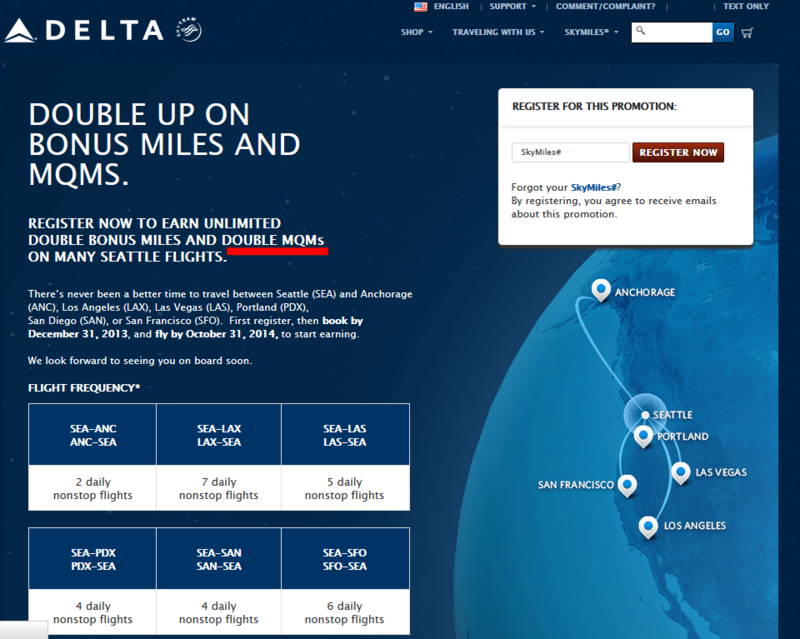 First, to match the offer Alaska Airlines has promoted (as the battle between the partners continues to heat up) Delta has improved the 2x Skymiles offer to include 2x Medallion Qualifying Miles as well. I reached out to Delta to see if you have already flown under the current promotional period if you could retro-actively get credit for the 2x MQMs and was told NO this was not being offered. This is only good from this day forward but it is a LONG promotion (ends 31OCT2014) so be sure to SIGN UP and we will have to look at this promo when factoring the CPM or cost per mile for mileage runs that connect via these cities. Speaking of mileage runs, there are some good ones right now from MIA to LAS as well as SAN and vice versa. Be sure to do some ITA Matrix searches and see what could work for you. Some are very nice for back to back trips to collect over 10,000 MQMs for under $500! It looks like this promotion is only for select destinations on the West Coast, so the 10,000 MQM for under $500 might not work. @HB – they are not the same. 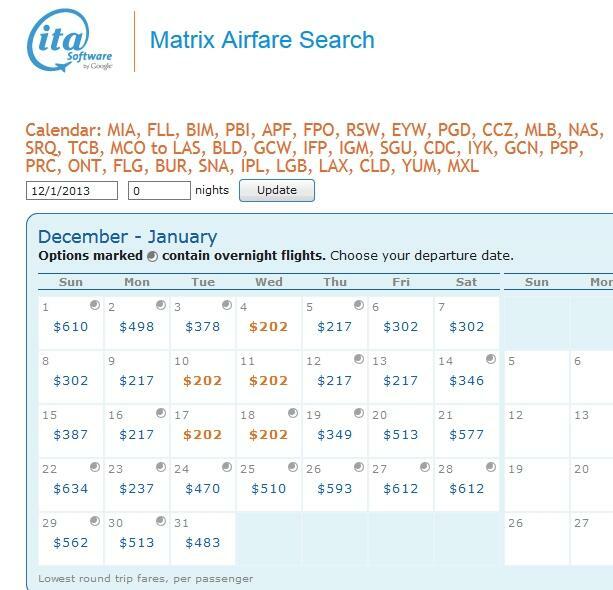 If you look at the MIA-LAS deal you will see two days back to back will yield well over 10k MQM for under $500. @HB – I do that all the time! No worries. 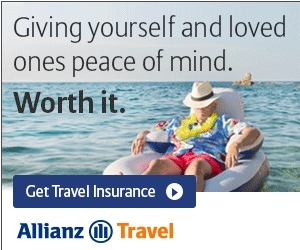 Any idea what you have to do for this targeted offer? @John – I wish I knew and they will not tell us. Sorry. I have a flight ATL-SEA in June. If I book the ticket by the end of the year, with a connection in LAX, I’ll get 2x miles and MQMs on the LAX-SEA legs? I’m looking at a san-anc run. I noticed that there’s a routing opportunity in msp. Would this count 2xmiles as well?? @penoir – only between the published routes / legs. no other routes count for 2x. if the routing to SEA is on a Delta flight but operated by another carrier, Alaska, does it still count? @Robert – T&C says: Codeshare flights operated by carriers other than Delta or Delta Connection are excluded from this offer. Despite the validity till 10/2014, the double EQM/RDM promo is pretty useless IMO given the fact that travel has to be purchased before 12/31/13. This offer is more for show than anything, especially given how short these flights are. Think about it – how many people will really be able to maximize this by buying a ton of travel more than 10 months out? Plus the fact that excluding ANC, the longest flight you can have here is ~1000 miles. So let’s say you book a flight or two this far in advance, I’d gather than realistically most people may benefit from an extra 1-2k miles. Unless you’re a consultant or somebody who flies every single week and can go ahead and book flights for all next year, you’re not going to see much here. Either my Delta search skills have diminished or I am just missing something. I am unable to find any non-stops from SEA to ANC except on Alaska. The site wants a stop in MSP on Delta metal. SFO to SEA show only Alaska as well. @Geoff – correct. For now Delta does not have any direct flight from SEA to ANC so that part of the promo is not until they start flying this summer. Kinda crazy when you think about it! I think misleading is a better term. @Geoff – I think Delta will be handing out a bunch of Skymiles as so many seem to think all they have to do is connect in SEA to get the points. Ugg! The one time a non-targeted promo is out and they do this! 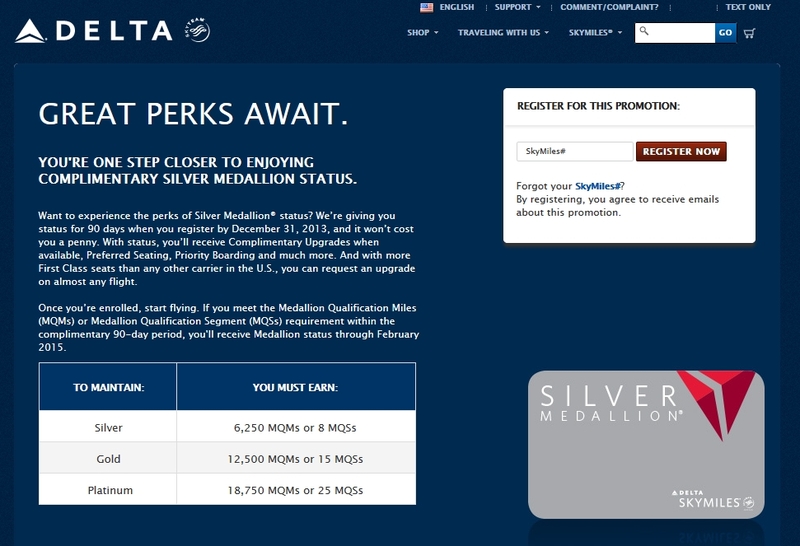 If I get the Delta Reserve card AFTER signing up for the provisional medallion status, will the MQM’s count towards the requirement to keep it until 2015? @Drew – it says FLYING for the promo. So, don’t BANK on it. It may work but doubt it. Regarding the complimentary medallion/90 day challenge status promo, I tried registering but it said I’m not eligible. It really would be incredibly useful for me as I am about to start flying a lot on Delta and could use the faster status.